Sony has rolled out its latest Core Duo-based consumer-friendly notebook, a compact unit with a footprint the size of an A4 sheet of paper, a 15.4in widescreen display and more than a hint of the Apple MacBook about it. The Vaio N10 can be configured with one of a number of dual-core Core Duo processors, 80-100GB of hard drive space, and either 512MB or 1GB of RAM. Every model incorporates a dual-layer DVD±R/RW drive, 802.11a/b/g Wi-Fi, Gigabit Ethernet, and Memory Stick and SD card slots. The display's a 1,280 x 800 job kitted out with Sony's shiny X-black LCD coating. 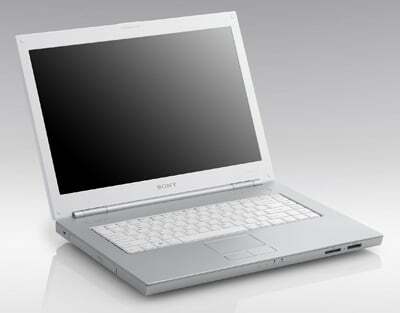 It's driven by the integrated graphics core inside the Intel 945GM chipset. There's a pair of USB ports, a four-pin FireWire/iLink connector and a 56Kbps modem on board. Like the MacBook, the N10 ships in white, with a recessed, button-like keyboard. Put 'em side by side and you might almost think they'd been separated at birth.